Internet along with Blog Sites & Blogging Platforms have destroyed most of the barriers to publication. Several bloggers have exploited the situation. The cost of Blogging today is almost zero. Today anybody can publish anything they want without seeking anybody’s permission. Blogging came, survived and has only strengthened over time. It is no longer a way just to express your passion or a hobby that people use to take up. For many, it has become a respectable profession and a source of earning on a monthly basis. The characteristics of blogging have also changed drastically from yesteryear blogs with just text and images to cool blogs with tags, comments, links, social media share, subscription buttons and more. Many blog sites, blogging platforms and tools got their way with the emergence and rise of blogging. You have come to this place that means you are looking to try out your hands at blogging. As a blogger, it’s important for you to know the best blog sites and blogging platforms to publish your blog. But, before anything else, let’s have a quick look at the difference between these two terminologies. How to Choose the Best Blog Sites? 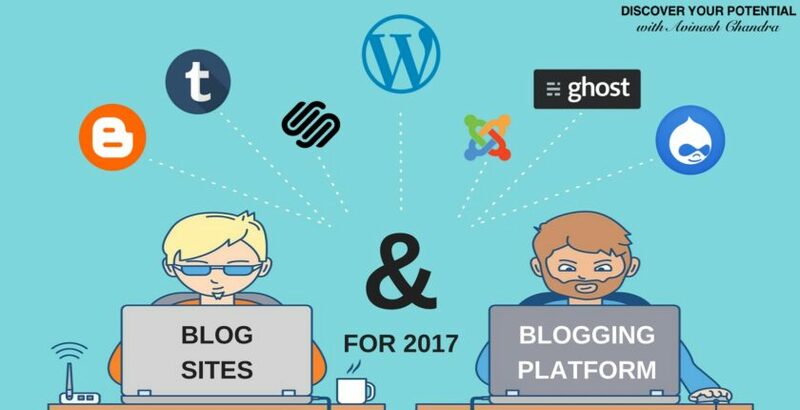 How to Choose the Best Blogging Platforms? It is a place on the internet that offers free or paid services to publish your blogs, such as wordpress.com, Squarespace, Tumblr, Blogger, Medium, etc. You can create your sub-domain on these paid or free blog sites and publish your content. 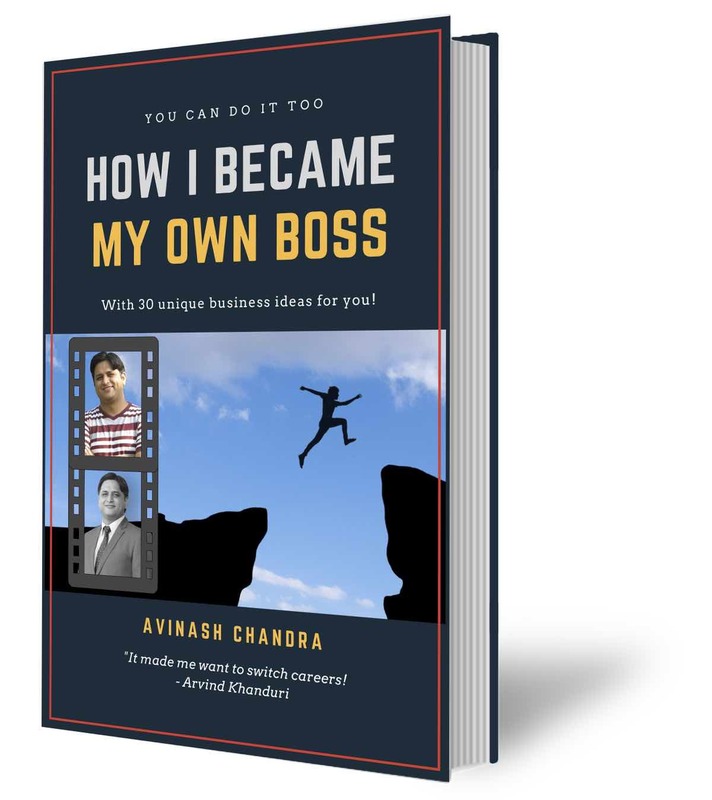 If you are hosting for free blog sites, your domain may look similar to www.avinashchandra.wordpress.com or www.avinashchandra.blogspot.com. Paid hosting allows you to have a custom domain. No need to worry about software updates or file backups as the service providers take it care. Free hosting on a blogging site provides you with a sub-domain URL. You will not have full control over the blog content or theme options. Does not allow to run an e-commerce operation and also there is a limitation on monetization of the blog site. Costs more if you go for added customization, plugins or theme options as compared to Blogging platforms (self-hosted version). Your blogs can be deleted anytime by the service providers if they find it is violating their terms and conditions. Zero to partial support for analytics tools. Limited bandwidth and memory space. Blogging platforms such as WordPress.org, Drupal, Joomla and Studiopress provide a self-hosted environment (software or Content Management System) for your blogs. Full control over the blogs and back-end files as it is hosted on your servers. Full-fledged plugin support (free and paid both). Allows customization as per your requirement. You can choose from the number of themes for your website. You can monetize your site without sharing revenue with anyone. Support for powerful tools like Google Analytics to monitor and track your website traffic and consumer behavior. You need to update the content management software and take file backups yourself. You have to purchase a hosting plan from a hosting provider such as Bluehost. WordPress.com accounts for more than 76 million blogs worldwide. The number tells you why it is one of the most popular blog sites. It provides some basic blogging services for free (including domain and hosting) and you have the option of paid upgrades to unlock the unique features. Let’s dig deep into the features (free and paid) provided by WordPress.com(3). If you are a newbie, you should consider wordpress.com to host your blog. It is flexible and easy to use. Some of the modern features like social media integration, comments and polls are available without adding any external plugin. WordPress.com has enough tools, plugins and theme options for veteran bloggers to customise their blog page and extend the functionality of their websites (2). Tumblr is a micro-blogging site which is very popular with youngsters. It is the simplest form of any blogger website. Tumblr thrives on the community of bloggers where each of them shares content with one another. There are numerous options for sharing and re-blogging contents. Tumblr is different from the other main blogging sites such as WordPress and Blogger that are more focused on text content. This micro-blogging site is more about visual bloggers as you find short stories, self-explanatory images, animated gifs or internet memes. So, if you are a professional blogger, you may want to look elsewhere. The Tumblr blogging plan ranges from free to $19-$49 for premium themes. It is most suitable for personal and artist blogs. Founded in 1999, Blogger (with www.blogspot.com subdomain) is a free blog-hosting website which is owned by Google. It is a great platform for Beginners looking to try blogging. You get default access to Blogger if you own a Gmail account. Simple customisation and easy to use are the terms that best define Blogger. Free hosting and custom Domain name. Drag and drop template designer. An option to edit the code. Touts a free mobile app (Android and iOS) for viewing and editing content. Blogs are by default integrated into Google’s AdSense program to provide monetisation option. While it offers some great feature, there are a couple of areas where Blogger lacks behind other competitors. Due to the non-profit operation, it lacks several desirable widgets and plugins. Default themes are not so stylish. Advanced users may not find it interesting as it is more geared for casual bloggers. Medium provides a quick gateway to free blogging. If you want your thoughts and ideas to take root on the internet, the medium is your best bet to get it done. Allows comments to be highlighted. 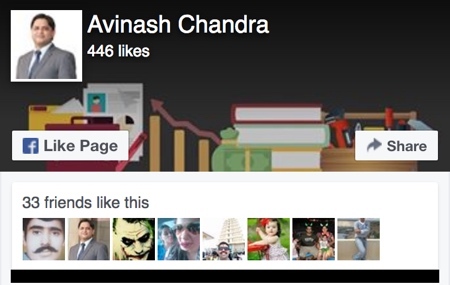 The dashboard shows the number of likes on a post and origin of traffic. Reading time for each post is mentioned enabling you to decide whether to read a post now or bookmark it for later. Allows third-party embedding such as videos from Youtube/Vimeo, content from Twitter/Instagram, etc. Easy to use without the need of coding knowledge. Suitable for small business owners and freelance professionals. Ultimate customisation and visual pleasure are the two standout features that best describe SquareSpace. It’s customisation features allow you to change almost everything without any knowledge of coding. Be it colour, font or sidebar width everything can be tweaked with just the touch of a button. 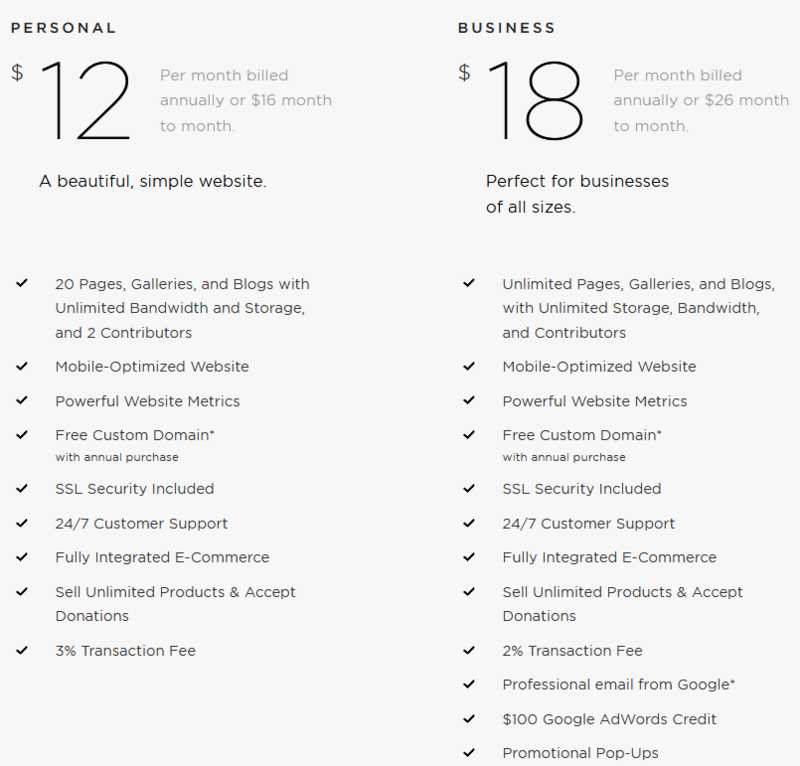 It costs $12- $18 per month (when you take an annual subscription(5)). Squarespace helps you build a website with a clean and polished look. It helps you create a flashy web design with highly responsive layouts. You have the option to create scrolling designs which generally requires a lot of coding on other platforms. The downside that bloggers find on Squarespace is theme and plugin support which is not so great and requires coding knowledge to enhance the functionality. It costs extra for an e-commerce addition and is only available as a hosted offering. Wix is a user-friendly online website builder with a hosting service. It is quite similar to SquareSpace but somewhat cheaper. If you want to have a great looking and optimized website in low budget, you should give Wix a try. Based on your subscription plan it costs $0-$18/month. By default you get a subdomain but you have the option to include your own custom domain. There are many designs and plugins available on Wix to extend your site. 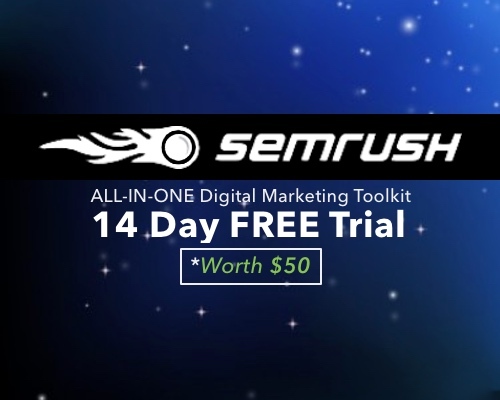 Helps you build a blog from scratch without any knowledge of design skills. Many plugins and extensions available via Wix App Market. If you are a business owner with no design or development skills and need both website and blog to go alongside, Wix is the place you should be exploring. Just like Blog Sites, Blogging Platforms (CMS or Website Management Packages) are readily available in the market. Each of them has a unique place in the world of website makers. In this section, we are going to discuss some of the top-rated platforms for creating self-hosted blogging websites. WordPress.org is an open source CMS (Content Management System) software that can be employed not only for blogging but to create e-commerce or other forms of the business website as well. It is 100% free for anyone to use. All you need is a domain name for your site and web hosting. It is 100% free for anyone to use. All you need is a domain name for your site and web hosting. A blog site on WordPress.org CMS, provides more control over website content and additional features such as e-commerce integration and creation of membership site. It’s estimated that 27% of all websites use WordPress. The best thing about WordPress.org is the availability of themes and plugins that can be added with the click of a button. The multiple theme options help you create a structured layout for the desired look and feel. The powerful plugins and widgets provide enhanced functionalities like social media share button, SEO tracking, analytics and more for your website. Users with more advanced skills have the option to customize HTML and CSS. In terms of administration, it is far better than other CMS platforms. WordPress is the most popular CMS in the world and is used by nearly 75 million websites. More than 409 million people view more than 23.6 billion pages each month. WordPress users produce 69.5 million new posts and 46.8 million new comments every month. It also powers more than 25% of the world’s websites. 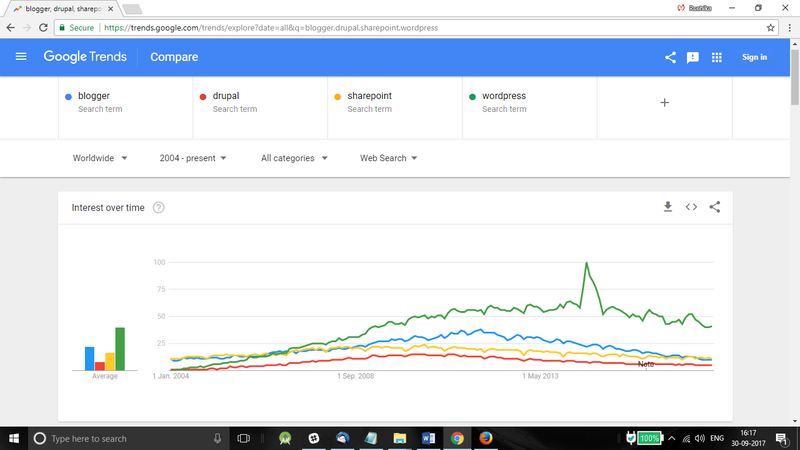 The above image from Google Trends (1) shows the rise of WordPress. WordPress is always improving and being an open-source design; it allows you to tweak the internal files/programs and add new functionality as you see fit. If you are really interested in generating some income from your blog, WordPress without a doubt is the way to go. Drupal is a free to use CMS which is used to create and organize blogs, website pages and other online contents. Companies primarily use Joomla to create blogs for their businesses. The functionality of Drupal goes deeper than WordPress(6). Drupal is better equipped to handle multiple page templates and content types. Compared to WordPress, Drupal is a bit complex and hence not suitable for bloggers trying to start out blogging. It does not provide blog hosting, so you need to find your own hosting server elsewhere. Drupal provides some starter themes (called modules) to add basic functionality, but for installing and updating a site on Drupal, you need a developer. Joomla is a complete CMS package for bloggers. Businesses and large corporations prefer Joomla over other platforms due to the powerful tools, functionality and flexibility(7) it provides to create a broad range of contents. Joomla is expensive compared to WordPress and Drupal. 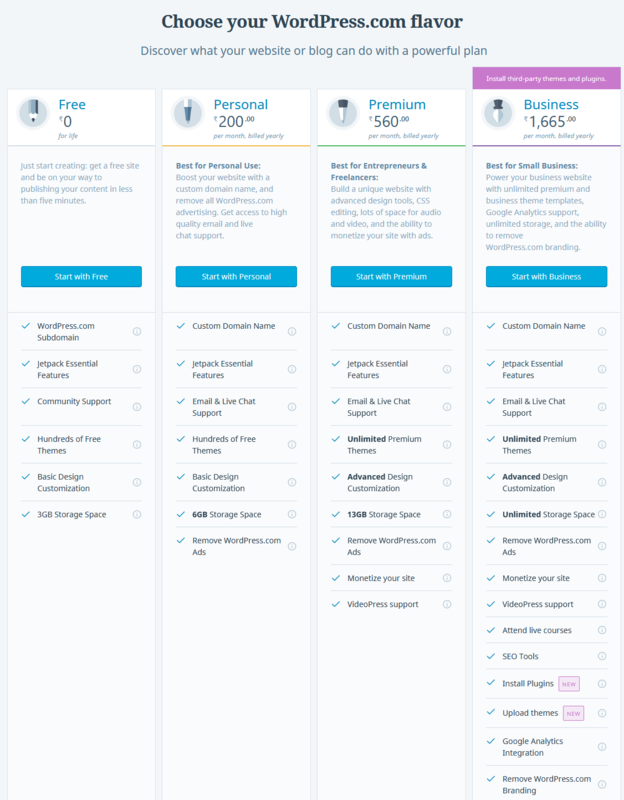 After the first free month, the charges of usage of this CMS are $20-$100/month. If you want to move from basic blogging to professional, then Joomla could be your option. Novice bloggers may want to stay away due to the complexity and cost it offers for initial setup. Ghost is another open source platform for blogging that provides a simple, clean interface. In many aspects, it is similar to WordPress with some unique features. Advanced and intricate blog design. Split screen editor – offers a live preview of your post on the right side while you continue to work on left. This feature helps in correcting any writing/coding mistakes as you go along. Multiple user support – Allows a team or fellow author to work in tandem on your blog. Organized content – Email template makes it easy to pick and choose your workflow. Ghost is a bit tricky to install at first but once done you will find it a great tool to work upon. 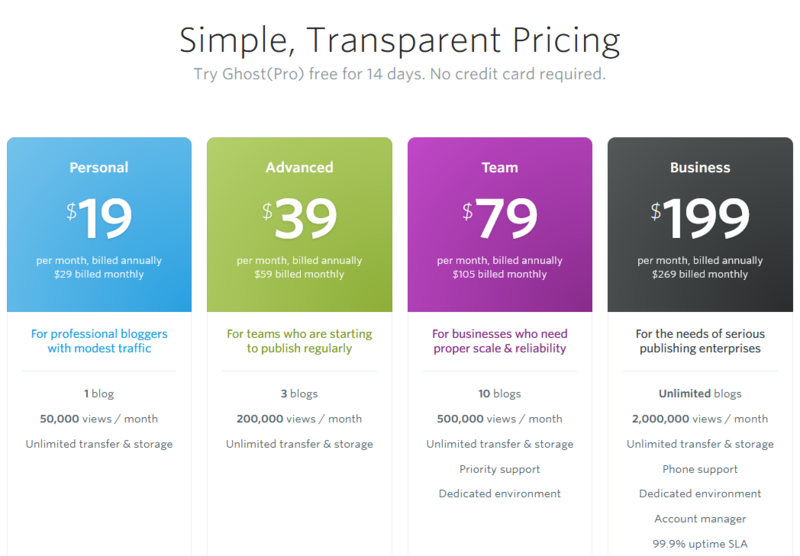 As a blogging platform, Ghost is perfect if you have a large team of writers and online businesses. SO, All blogging sites and platforms have some unique features. If you ever embark on the blogging journey make sure to choose a platform that cater to your needs. After all blogging is more than just writing or posting photos. Happy Blogging! Features to help you publish anything, anywhere.